We’re excited to announce the relaunch of our new website. The web site has gone through an entire face lift, with major changes to the structure and content to improve user friendliness and appeal. In addition to the changed design of the pages, new functions such as dropdown menus have been implemented giving our users ease to navigate around our website. Our website is compatible with both mobile and desktop versions. Our new website accommodates a whole lot of new features; including our exceptional manufacturing capabilities and our aerospace standard quality management approval. There are options to browse through our history, our team or you can view our photos and videos. 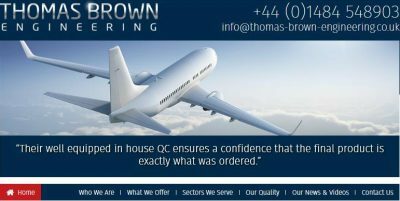 To check out our website, visit us at www.thomas-brown-engineering.co.uk.